The longest lines at Denver’s annual Great American Beer Festival stretch interminably around the Colorado Convention Center. It’s the country’s largest beer fest, drawing 60,000 attendees last year for the more than 4,000 different beers flowing within its walls. You can find nearly any style you like, including some of the most highly regarded beers in the country. But behind the pouring booths, the visiting brewers weren’t talking about the juiciest IPAs or most decadent imperial stouts. No, the buzzy place to visit among the brewers themselves was Denver’s own Bierstadt, a year-old brewery dedicated to classic German lager styles. “Have you had the pilsner?” everyone seemed to have asked me. I wanted to taste what the fuss was about. After an exhausting day at the festival, I made it to Bierstadt. I recognized brewers from the festival lined up two-deep at the bar, waiting. Waiting. Waiting. Two bartenders stood facing the taps, hardly even glancing over their shoulders to see the throng gathered at the rail. They filled glass after glass with a pale, straw-colored beer capped by a gorgeous white foam, but still they couldn’t keep up with the glasses flying off the bar top. This was the pilsner everyone was talking about, but getting to taste it required patience. That’s not just because it was the sudden darling of taste-making brewers, but because the beer itself takes a long time—around five minutes—to pour. Hence its name: Slow Pour Pilsner. The ritual of the slow pour isn’t intended to frustrate thirsty guests. It’s a German technique that, brewers say, softens the beer’s carbonation and opens up its delicate flavors. For breweries that make German-style pilsners, it’s a point of pride to pour the beer this way—and if you’re a pilsner purist, you’ll come to appreciate the time-intensive step. The process goes like this: A bartender begins by aiming the pour for the center of a pilsner glass glass so the foam bubbles up, creating a one-third beer, two-thirds foam ratio. After a few minutes when the foam has dissipated a bit, the bartender would pour a second stream of beer into the glass until the foam reaches above the lip of the glass. Ideally, a few more minutes would go by, during which time the foam would settle. Finally, the beer is topped off. 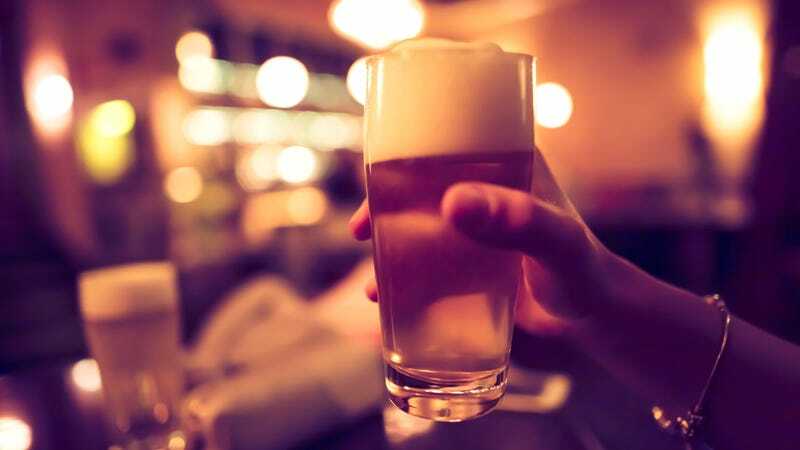 Beer drinkers can replicate the pour with bottled or canned beer: vigorously pour the first splash into the center of the glass until the foam reaches the lip, then follow the same steps. Whether at a bar or at home, the pour should take three to five minutes total, which can feel like an eternity in beer time, especially for Americans. We don’t drink beer like the Germans do. We want our beer ice-cold, and we want it fast. Remember the Miller Vortex bottle? It was an entire marketing campaign championing a bottle that gets beer into your facehole faster. And I’m no historian, but I think it’s unlikely that anyone but us invented shotgunning a can of beer. The slow pour, however, is how pilsners were traditionally served in Germany for a few historic reasons. Namely, Germans consumed their beers at a warmer temperature than Americans do, around 45 degrees compared to Americans’ preference for near-freezing drafts. Increased temperature made the beer foam more, and not wanting to pour any of their valuable liquid, bar owners tended to let the foam settle rather than pour or scrape it off the top. When crowds gathered at happy hour, it wasn’t uncommon for German bartenders to line up a stack of half-filled pilsners to create an assembly line of filling, foaming, and topping off. A side effect of all this slow pouring is that the happens to make good pilsners taste even better. Bierstadt’s Ashleigh Carter insists this isn’t just a beer snob fussing; she says a proper pour and proper glassware are crucial to tasting a German pilsner’s bright hops, crisp lager finish, and smooth carbonation. As with any ritual, there’s also an aesthetic and cultural piece to the slow pour. Thorsten Gueur, brewmaster at Missoula, Montana’s Bayern Brewing, says that in his native Germany, a moussey, rocky head that reaches above the lip of the glass is a sign of a beer’s quality. Serving a beer slowly, in a clean and proper pilsner glass and with the requisite amount of foam is a matter of personal pride. Ditto for Ashleigh Carter, who says she’s a stickler for multiple aspects of beer service. For example, she won’t let bars serve her beers without proper glassware—meaning no standard Shaker pints—because those pint glasses mess with the way the hop and sulfur aromas in her beer are perceived. Taking the five minutes to slowly pour a Bierstadt pilsner, she says, is completely necessary to enjoying it. Having consumed the Slow Pour Pilsner for myself, I’m on board. Even though I was tired, thirsty, and surrounded by a huge crowd at Bierstadt, once that pilsner slid across the bar, it looked and smelled perfect. I didn’t regret at all the five minutes I spent waiting for it—though I did order a second one once I was halfway done with the first. Patience is a virtue, I reminded myself, even when it comes to beer.